Eli Banks heads west into the foothills of the Rockies to search for wild horses, but when he hears a cry and encounters Clare McKay and her young brother in need of help, he strides headlong into danger. While he’d hoped to find wild horses, he finds something just as challenging—an Irish gal with a wild heart. Spring, 1873. Eli Banks stares out the window of his ranch house just north of Greeley, restless. It’s been a long, harsh winter in Colorado Territory, and he’s itching to ride out on the Front Range once the drifts of snow melt. So when his ma asks him to take a payment to a man in Fort Collins for some horses she’s buying, Eli is glad for the task. Once his transaction is completed, he follows horse tracks into the hills, excited at the thought of adding a new wild herd to his family’s ranch. But in the middle of his pursuit, he hears a gal’s alarmed cry and hurries to investigate. Clare Ferne McKay, caring for her squalling younger sisters, is called outside by her mam, who tells Clare to go look for her brother Paddy, who left to tend the family’s cows an hour ago. Clare, the oldest of seven siblings, is glad for the chance to get out of the stifling cabin. She follows the tracks Paddy’s horse had made in the deep snow, but when they stop, she finds the horse but not her brother. Then, she sees Paddy across a frozen pond, tending to a cow in labor. There is no way to get to Paddy but across the ice, but the warm day is quickly melting the surface, and when Paddy tries to meet her partway, the ice cracks and Paddy is in danger of drowning. 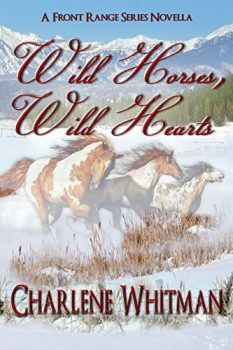 Wild Horses, Wild Hearts is the prequel to the Front Range series of sweet historical Western novels set in Colorado in the 1870s.